The second finger on Newport’s South Jetty is a great site is a little bit deeper than the first finger and is smaller than the third finger. There is plenty of life on the jetty rocks that stick out into the Yaquina River’s exit to the sea. SCUBA divers are rewarded diving this site by abundant marine life. We have found many nudibranchs here over the years. Good crabbing and spearfishing are also to be had on the second finger in the right conditions. The view from the second finger on the South Jetty at Newport is spectacular on a clear day. The main highlight on the second finger is the swarm of micro life. We have found many nudibranchs here. If you are patient and go slow, you will be richly rewarded with all sorts of interesting creatures revealing themselves. If you’re more into crabbing or spear fishing, at the right time of year this SCUBA diving site can be very productive. This is also a good place to go if the fingers closer to the ocean (fifth, fourth, and third) are too rough due to ocean conditions or are too busy with fishermen and crabbers or other SCUBA divers. From US101, take the aquarium exit and follow signs to South Jetty and Southwest Jetty Road. Parking right next to the second finger dive site is a little limited but we have never had trouble finding a place to squeeze in. Park on the north side of the road in the sand. Imagery ©2017 Google, Map data ©2017 Google. The second finger on the south Newport jetty is a fun little place to play around and hunt for fish. The second finger, while short and stubby, is still aligned roughly north-south like all of the other fingers on the Newport South Jetty. Only a few kick cycles are needed to reach the end of the second finger. We prefer to dive this site very slowly to look at all of the tiny marine organisms that call the second finger jetty rocks home. If you want to go faster, combining this dive with the third finger can make for a longer underwater swim. While you can climb over the jetty rocks almost anywhere, we find it is easiest to enter and exit right at the base of the second finger where it joins the jetty. Be sure to scope out the way to the entrance before you don your gear to make sure you know where you will go once you have 100 lbs of SCUBA gear on. This is a shore dive. We don’t recommend trying to dive this site with a boat because the site is shallow and really isn’t worth the trouble of putting a boat in at the marina in Newport. This site will often have a little surge but nothing nearly as bad as out on the fifth finger. 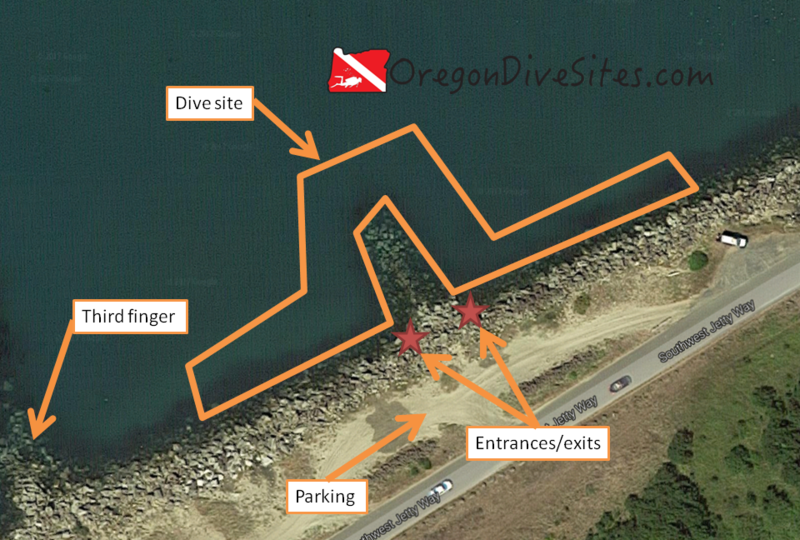 We have encountered a little current at the tip of the second finger when we are diving way off tide but the third and first fingers protect the second finger from the majority of the tidal currents in Yaquina Bay. This site usually maxes out in the best conditions at 15 feet of visibility. 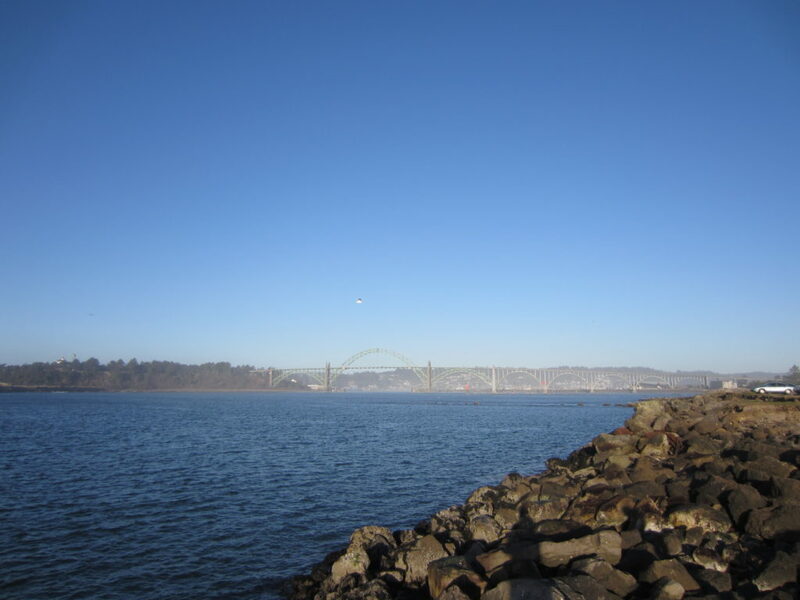 If you try diving it at low tide, aside from being in only a few feet of water, you will also find there to be almost no visibility due to the water being pumped out of the Yaquina River on the way to the ocean. On stormy days in the ocean, this site sometimes has about five feet of visibility but most SCUBA divers going to the second finger will find around 10 feet of visibility. Remember to keep your buddy close! We have gone diving here when the water was 42F and when the water was 50F. Seasonal temperature variation in the ocean and the amount of water flowing out of the Yaquina River change the water temperature you are likely to see at this site. We prefer diving this site in the spring and fall although the winter is also good at this site. In the summer, we usually don’t dive the second finger because we generally focus our attention further out toward the ocean where conditions are usually favorable for SCUBA divers in the summer months. We once found 30 feet of water here at an extremely high tide but usually you will find a depth of about 20-25 feet at high tide at the tip of the stubby little second finger dive site. Open water divers successfully dive this site although the entrance and exit are a challenge due to having to crawl over the jetty rocks. For this reason, taking an advanced open water course or doing a discover local diving trip with experienced divemasters or instructors may help you dive this site more comfortably. We rate this as an intermediate dive because of the entrance and exit. If you get good parking, you will only have to climb over 50 feet of jetty rocks. There is no surface swim necessary at this dive site. If you try diving this site at anything other than high tide, you won’t find enough water to have much of a dive. We like taking a good dive light with us to look in all of the cracks and crevices of the jetty rocks that make up the second finger dive site. There is a lot of great micro marine life that has wonderful colors with good illumination from a dive light. There is a local dive shop in the South Beach area of Newport that does air fills, services gear, and has a limited selection of new and rental equipment. Both the north and south bayfronts of Newport offer a lot of great dining and some good breweries and pubs, too. We have camped several times in the South Beach State Park campground. 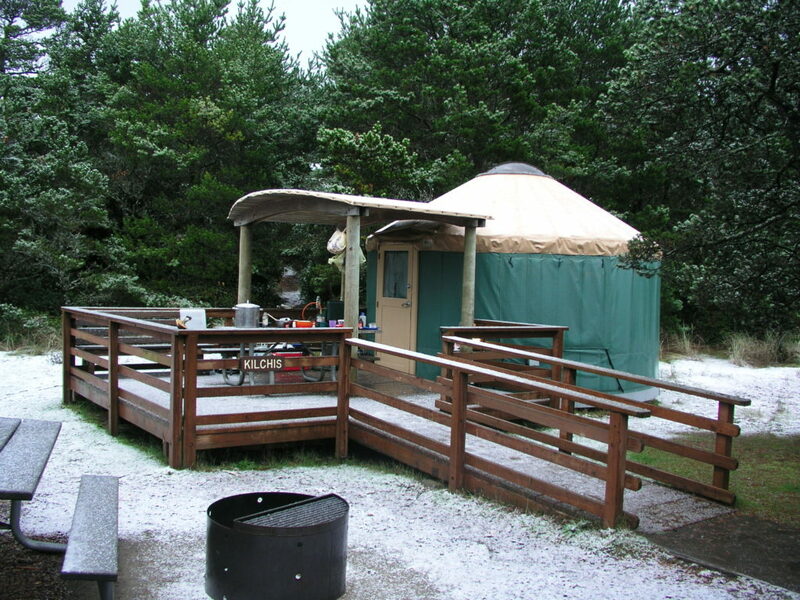 The yurts at the campground are great to rent in the winter when the air is cold and damp. We haven’t stayed in any of the hotels in Newport but if you have and can recommend a diver-friendly hotel, let us know!